"Firstly I would like to thank the judges, stewards and all the helpers that made it another great day at Grangewaters. By far the largest test I have had to manage with a total of 64 dogs entered, and only a couple of hic-ups on the day. The weather was fine, blue sky and a gentle breeze made it perfect conditions with a total of thirty passes overall with two great E passes as the light began to fade. It was nice to see a lot of new faces attend our first test of the year and I hope we didn't disappoint. Looking forward to seeing you all again very soon." Green's Evanpark Jensens Button "Billy"
Mercer & MacKillican's Darkpeak Born To Run "Aoife"
Walker's Hanningfield Simple Dreams "Olivia"
Graves' Shalowseas Rhyme Nor Reason "Freddie"
Jamieson's Safeharbour Albany Surf "Domino"
"It was a great pleasure to judge Section A tests on my 'home turf' at Grangewaters and my thanks goes to the Southern Newfoundland Club for the invitation. The weather was gorgeous, the lake calm and sparkling in the sunshine with the lightest breeze and the water quality was excellent. It is a beautiful setting with every facility and a venue everyone seemed to enjoy. My co-judge, Kay Burridge and I had a large entry of 26 dogs, so a lot to get through. There were 23 present on the day and with one dog withdrawn there were 15 passes. Ages ranged from the youngsters only just old enough to test and who showed great promise, to dogs well into their veteran years and included one dog who despite needing assistance to get down the slope and into the water had no problems when in the water ... wonderful evidence of how beneficial swimming is as a form of exercise for our beloved newfies. Well done to all of the handlers and dogs, whether a pass was achieved or there was a slip-up on the day, everyone without exception was in good humour and accepted our decisions and advice with grace, thank you all. The overall standard of the passes was very high with several dogs not losing a single point. The most common problem among those that weren�t successful on the day was climbing on the handler in exercise 2. With experience the handler can see if the dog approaching is coming directly towards them when they get close even when the water is being tapped to the side. In that case a quick swimming kick to the side can get the handler out of the way at the last moment and avoid the contact or the dogs� own article (which is permitted in the regulations) can be held at arms length to reset the dogs focus away from the owner/handler. The new test regulations didn�t seem to cause any issues, there was no 'double handling' and having the steward throw the retrieve object in exercise 3 wasn�t an issue for any, the handlers were still able to show the object to the dog first but there was better consistency in the distance the object was thrown. Finally, my thanks to our Test Manager, Tina Roberts who I know puts in a huge amount of work both before the test and on the day, to Claire for looking after us with hot and cold drinks and the much needed sun-screen cream, to Grangewaters Working Newfoundlands for the hospitality and a truly impressive buffet, to the stewards and Al the helmsman for a job well done. Special thanks to Kay Burridge my co-judge, it was a pleasure to share the judging with her and we were in complete agreement on our decisions, right down to identical marks on our scoring sheets, I believe." "I would like to thank the SNC for inviting me to judge at Grangewaters, which I thoroughly enjoyed. There was a large entry of 26 dogs, but only 23 dogs were present on the day with 15 high class passes. Those who failed did so mostly due to climbing, either on the boat, the handler or in some cases, both. The new regs didn't cause a problem and seemed to be well received by all entrants. 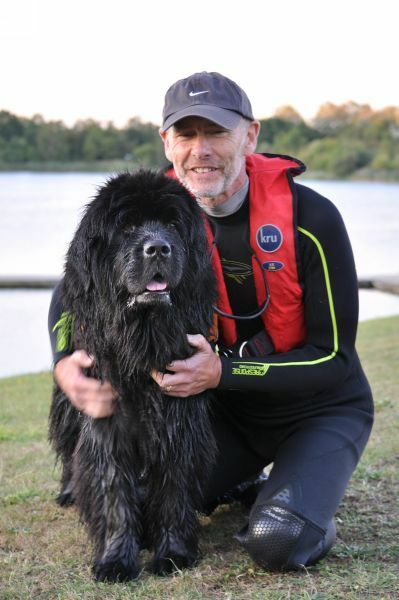 It was a joy to watch all the dogs in the water, from the youngest at just 6 months of age, through to several veterans and one who had severe problems getting down to the lake, but thoroughly enjoyed being able to move effortlessly in the water. Finally, I would like to thank Paul Dodd, my co-judge, Tina Roberts and her team for an enjoyable day and special thanks to the stewards whose high standards made our jobs much easier." Mercer & MacKillican's Sheenmarie Enchanted "Diesel"
Moss' Uskrail Thunder Vine "Crispin"
Froggat's Safeharbour Wipe Out "Buddy"
Kimberlin-Wyer & Portington's Dearchary Queen Of Diamonds "Lizzie"
Jamieson's Dixie Coco Bay "Grizzly"
Saunders' Zaiton Calico Jack "Dougal"
Smith's Kalibah Mistletoe Kisses for Comfortcove "Tink"
"Thank you to my fellow Judge Keith Dobson and to all the stewards who helped out during the day we had 21 dogs of which we had 10 passes. Many of the dogs did very well and just missed out by not being able to complete only one of five elements in lot of cases this proved to be the safe swim. So many of the entrants and dogs were very close to passing and for some it was a case of just getting it right on the day. We were told by many that they had been able to complete all the exercises during training but when it came to the test just didn't do it on the day. They could of course just had an off day, but going on my own experience with my own dogs I would recommend that some at least would benefit from having more test experience as it is very different to the relaxed training sessions that they are used to. Others will need more time on the safe swim especially the youngsters.So good luck and keep practising, I am sure with a bit more effort you will all pass next time." Smith�s Ursanigra Loweswater of Comfortcove "Tia"
"A lovely day weather-wise with good calm water and a light breeze. Out of 5 entries we had only one pass. However the remaining dogs all performed well and each only failing on one different element of the test which I am sure they will all overcome in the near future giving them a good pass next time. My thanks to my co-judge Karen, all the stewards and helpers, Test Manager Tina Roberts and Grangewaters Working Newfoundlands for a wonderful spread." Johnson's Evanpark Ghost among Piratebears "Minnie"
Baugh�s Bearhugs Harry Potter at Quietstorm "Mr. Potter"